“During the process of creating our list of top startup books, we discovered that many of the books that are most often referenced are from Silicon Valley or San Francisco. This geographical prefrencing creates a distortion in markets where entrepreneurs believe something they read, rather than local information that they have self-generated. The problem with traditional Top 10 Book lists is that the embedded assumptions in writing the book often do not translate to the Silicon Prairie. We endeavored to create a book list that identified top startup books from non-traditional locations while still identifying common books often referenced that come from San Francisco and Silicon Valley. Our ranking is premised on an internal poll within the SPN writing community and is not objective––but it provided a new heuristic for us regarding the invasive spread of ideas regarding Valley and Bay Area methodologies. At SPN we believe in flyover country, and we know that we can learn much from NYC, San Francisco, or Silicon Valley; however, at times the books from those areas are not entirely applicable for the environment on the ground here. This book is similar to Startup Communities by Brad Feld (which describes the Boulder Thesis), but better because of its rich descriptions and foreign-ness, allowing someone from the Prairie to identify how unique local strengths may, in fact, be the key to local success. It describes why Israel has become a hotbed for startups. Specifically, it references multiple actionable items for communities based on Israel’s success. For example, it references the reduction in social barriers created by having a military requirement and the focus on building water technology to allow the country’s population to expand into the desert and grow dramatically. If you are an economic development person, this is a must-read. Chapter two of this book may be the best forty pages of this entire list in terms of how to think about marketing and sales for a new venture. There are key insights throughout the book about how to create a scaling company – including virality, small changes to society, and a number of other deep insights. This book is similar to #9 The World is Flat by Thomas L. Friedman, in that it is not really a startup book – but a sociological one. This book covers similar ground to Art of the Start 2.0 – as a practical guide to starting a business. Guy Kawasaki’s Art of the Start 2.0 is better, but it is premised on having knowledgeable people across all components of the ecosystem. As any Silicon Prairie founder knows, a challenge in the region is that the lack of transparency and quality across the ecosystem leads to many strange encounters that are inconsistent and with people that may have good titles, but often limited startup knowledge. The Pumpkin Plan is a how-to manual on how to control the outcomes through your own actions – while it is targeted at scaling companies, it speaks to more of a large small business audience. The Innovation Blindspot talks about why venture capitalists are not good at identifying the best startups in the wild – particularly those started by people of color or women. It is a transformative idea bundled into an unassuming book. At times, the book gets a little effusive with the praise for such luminaries as Steve Case, but overall it represents a unique view of venture capital and why it should be changed. A good book that would supplement this is Venture Deals by Brad Feld and Jason Mendelson. Feld and Mendelson’s book is more of a primer for entrepreneurs’ preparing to raise money. 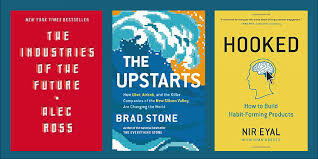 All three of these books are good additions to your reading library. 3. Business Model Generation by Switzerland-based Alexander Osterwalder. This is a strong method book regarding how to build a business model canvas. This tool is used by many academics and entrepreneurs alike for laying out a value proposition for a new business. The book is similar to Four Steps to the Epiphany by Steve Blank The Lean Startup by Eric Reis. The latter two are better known, but they are both guides on how to build a lean startup. Business Model Generation has an action plan and playbook built into its premise. It is an incredible way to put your value proposition onto paper and recognize the gaps and strengths. This is a great book by Austin, Texas based Mares, and Philadelphia based Weinberg, one of the founders of DuckDuckGo – a Google competitor. This book provides actionable metrics for social and other marketing campaigns. It is light on stories and heavy on math. It is a useful book if you are into that kind of thing. It is better than Traction by Gino Wichman which is more of an operational assessment and playbook – focusing on strategic operations. Livonia, Michigan based Wichman’s book is popular with organizations that have an engineering feel and want to have a planning tool. It is a scale-up structure book. Women’s Startup Culture Book – Sarah Lacy’s Uterus is a Feature, Not a Bug and Lean In by Sheryl Sandberg do not have a comparable non-Silicon Valley startup perspective. This seems like a gap. Strong female writers such as Willa Cather or Sarah Orne Jewett have provided incredible local insights. Writing a strong, hyperlocal story about women in entrepreneurship sounds powerful to us. Founders at Work, Jessica Livingston’s anthology book, is fabulous and crafted from her connections at YCombinator, but there is not a similar anthology book for non-Silicon Valley startups––though that would be fantastic. Specifically, some of the most compelling stories from the book are about people who came from the Midwest to Silicon Valley to find their way. For example, Max Levchin’s PayPal interview is excellent and references his move from Champaign to Silicon Valley. This could stand as the key story regarding why Levchin or Evan Williams moved from the Midwest to Silicon Valley. They did not move because of economic development attraction––they moved because of the potential peer group and access to people and capital. This book is the secret reason for the new SPN conversation piece – 8Qs with a Silicon Prairie Founder. We loved Livingston’s book so much that we wanted to hear real stories from other real founders about what they really did, love, and think about. Who are these heroes among us? Love our list––comment on Twitter. Hate our list––comment on Twitter. Want to add to our list…you guessed it, hit us up on Twitter.